As many of you may remember a while back we highlighted a custom project by Alvin Vandever. The project, a large silver pot, went on to win top awards at several shows in the southwest, and was the largest project Alvin had ever attempted. Several months later, a request came though: someone had seen the pot and wanted one for themselves. So late in 2013 he began work on what would become his largest project to date. Now, four months later, the pot is almost done. What started as a flat, half-circle of silver has been masterfully crafted into a stunning work of art. Our photographer caught up with Alvin for a few moments a while back and took a few photos of the progress at the time. 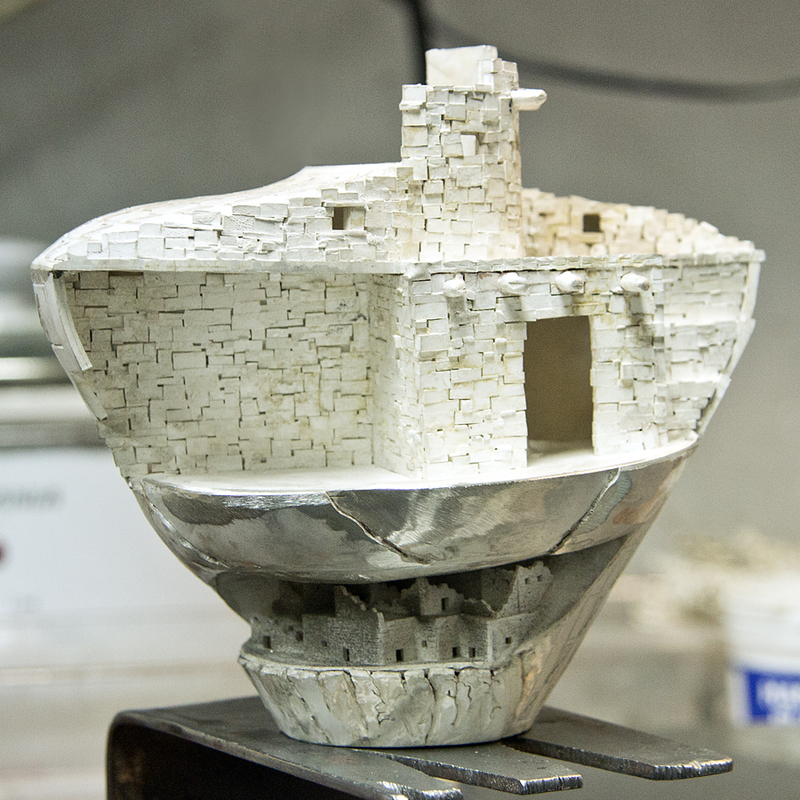 The piece has progressed much since then, and even now the polishing process has already started. While the final reveal is still a few weeks out, we’re happy to bring you these two photos of the work in progress. The first shot is of part of the soldering process, a process that requires a lot of heat and finesse. Large sections of the piece must be heated to several hundred degrees with an acetylene torch before solder can be added. 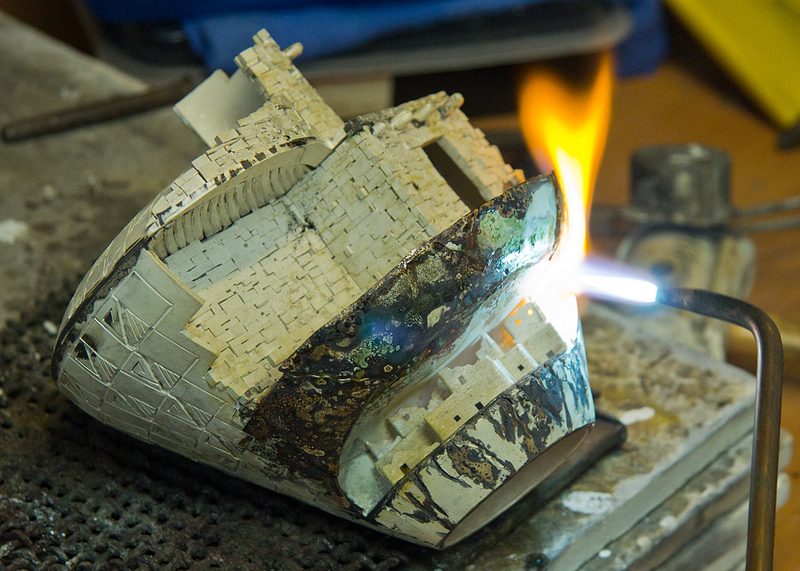 Once the soldering is complete, the piece must be allowed to cool. This first picture was taken as Alvin used an acetylene torch on the piece. After the piece has cooled, it must be dipped in acid to remove the flux, which is an acid that helps the solder to flow correctly. Because of the difference in temperature, the pot must cool off before being dunked in the acid. If the silver is too hot during immersion it will crack, ruining the piece. This second photo was taken after the acid bath. The acid leaves the silver looking powdery white, and it must be polished thoroughly to achieve a mirror-like finish. Stay tuned for more updates as we release them! We’ve already scheduled a photo shoot with the pot in the upcoming weeks, and we’re beyond excited to see the finished product! And of course, if you think of a custom piece you’d like to see made, let us know. Not all of our custom projects are huge 4-month long undertakings. Many of our custom pieces can be made in a few hours or a day or two.